Comparison between the recently developed LaB6 nanowire field-emission electron source and the conventional electron source. The use of the new electron emitter allowed the development of the source of ultra-bright electron beams, with their energy spread being two-thirds of the energy spread associated with a contemporary electron emitter. Researchers at the National Institute for Materials Science—Han Zhang, Senior Researcher, Spin Characterization Group, and Jie Tang, Group Leader of the One-Dimensional Nanomaterials Group, Materials Processing Unit, and collaborators developed technology to fabricate lanthanum hexaboride (LaB6) single-crystal nanowires with clean surface, a promising cold field-emission electron source for electron microscopes and other devices, and thereby improved the performance and stability of the electron source. Furthermore, by installing the new electron source into a scanning electron microscope, they successfully obtained high-resolution images, demonstrating that the electron source can actually serve as a source of ultra-bright electron beams for electron microscopes. To increase the spatial resolution of electron microscopes, it is necessary to obtain ultra-bright and highly coherent electron beams by narrowly focusing a large amount of electrons emitted from an electron source. At present, high-resolution electron microscopes are equipped with needle-like tungsten as an electron source. To increase the spatial resolution of the microscope even higher, efforts had been made to develop a field emission electron source using LaB6, which emits electrons more easily than tungsten. However, the synthesis of nanowires—a requirement for the development of a field emission electron source—using LaB6 was challenging because this very hard material was difficult to handle. In collaboration with Dr. Lu-Chang Qin, a professor at the University of North Carolina at Chapel Hill in the United States, the research team succeeded in the fabrication of the electron source consisting of a LaB6 nanowire by employing chemical vapor deposition. Furthermore, the research team developed technology to clean the surface of the LaB6 nanowire, which led to the improvement in electron emission characteristics and stability of the electron source. 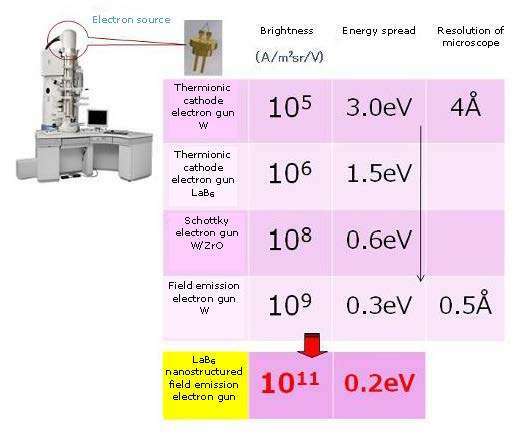 The research team confirmed that the newly developed LaB6 nanowire electron source was capable of producing highly coherent electron beams, which were 100 times brighter and had an energy spread of two-thirds compared to the current tungsten electron source. The team also verified that, when the electron source was installed in a field-emission electron microscope, its electron current density was 1,000 times greater than the conventional electron sources and it lasted 5 hours of use without attenuation in the emission current. Moreover, the team actually observed samples using an electron microscope equipped with the LaB6 nanowire electron source, and obtained electron microscopy images with a resolution higher than the conventional standard level. The LaB6 nanowire electron source can be easily installed in devices by simply replacing the conventional tungsten electron gun (electron source) with it. In the future, the team plans to work on practical use and commercialization of the LaB6 nanowire electron source through joint research with industrial partners.